Annual U.S. crude oil production reached a record level of 10.96 million barrels per day (bpd) in 2018, 1.6 million bpd (17%) higher than 2017 levels. In December 2018, monthly U.S. crude oil production reached 11.96 million bpd, the highest monthly level of crude oil production in U.S. history. Annual U.S. crude oil production reached a record level of 10.96 million barrels per day (bpd) in 2018, 1.6 million bpd (17%) higher than 2017 levels. In December 2018, monthly U.S. crude oil production reached 11.96 million bpd, the highest monthly level of crude oil production in U.S. history. 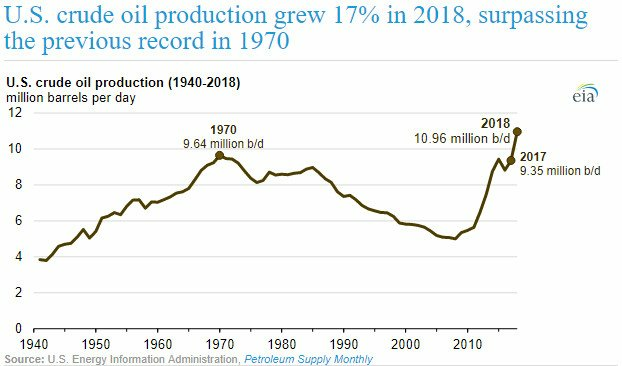 U.S. crude oil production has increased significantly over the past 10 years, driven mainly by production from tight rock formations using horizontal drilling and hydraulic fracturing. EIA projects that U.S. crude oil production will continue to grow in 2019 and 2020, averaging 12.3 million bpd and 13.0 million bpd, respectively. Texas crude oil production averaged 4.4 million bpd in 2018 and reached a record-high monthly production level of 4.9 million bpd in December 2018. Texas’s 2018 annual production increase of almost 950,000 bpd—driven by significant growth within the Permian region in western Texas—was nearly 60% of the total U.S. increase. Several other U.S. states or regions set production records in 2018. Growth in the Permian region, which spans parts of Texas and New Mexico, also drove a 215,000 bpd, or 45%, production increase in New Mexico. This level was the second-largest state-level growth in 2018 and accounted for 13% of the total U.S. increase, setting a new annual record production level in New Mexico. In the Federal Gulf of Mexico, new projects and expansions that have started since 2016 have contributed to the growth in production in 2018. Oil and natural gas producers brought online 11 new projects in 2018, and 8 more are expected to come online in 2019. The Federal Gulf of Mexico’s crude oil production grew by 61,000 bpd, leading to its highest annual average of 1.74 million bpd. The Federal Gulf of Mexico was the second-largest producing region in 2018. 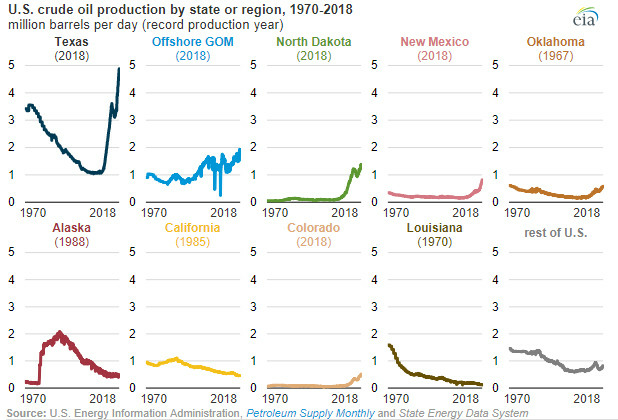 Production levels in Colorado, Oklahoma, and North Dakota each grew by more than 95,000 b/d from 2017 to 2018. In Colorado and North Dakota, this increase was enough to set new record production levels for the year. Production increases in Colorado were driven by the Niobrara shale formation, while continued production in the Bakken region drove increases in North Dakota. Oklahoma’s crude oil production has yet to surpass its record level of 632,000 bpd set in 1967. Increases in these states and regions were enough to offset production declines elsewhere. Alaskan production decreased by 16,000 bpd and California’s production declined by 13,000 bpd, the state’s fourth consecutive annual decline.